Purchase tickets from any of the below sites. Read the Check-In procedure, Bag Check Requirements and other FAQ. Refer How to get there for directions and parking instructions. We at AID LA-OC are working hard to present you with a fun day that you will remember for years to come. Hence, please read this email completely and forward to everyone in your party to be better prepared for the day and a hassle-free check-in. Please route your GPS to 239 N Harbor Drive, Redondo Beach CA 90277. This address gets you directly to the parking lot closest to Seaside lagoon and prevents you from being stuck in traffic. Please arrive at 11:00 am to avoid traffic congestion and longer wait time at check in! You can attend only on the date on your ticket. Please do not travel to the venue on the other date as the venue is at full capacity on both days and your ticket will not scan on invalid dates. At check-in, have your email confirmation and ID ready for the ticketing team to verify. Note: Tickets are not transferable and non-refundable. No outside colors are allowed. To ensure we are playing Holi with natural and safe colors, we cannot allow outside colors inside the event venue. Please bring CASH !!! for the purchase of additional colors, food, and parking. Address to the venue is 239 N Harbor Drive, Redondo Beach CA 90277. The entrance to the parking lot is on N Harbor Drive and NOT on Portofino Way. From 190th Street, go west toward the beach until the street ends, then turn left on Harbor Drive, and proceed for about one mile. You will see a parking lot and a sign that says ‘Redondo Beach Marina’. AID encourages you to carpool with your friends and family. You can also get to Seaside Lagoon via public transportation on Metro (Bus 130) to Beryl/Harbor Stop. AID LA-OC will be validating the parking ticket for a subsidized parking fee. Please bring CASH !!! You would have purchased the ticket using one of these 3 Ticketing Websites, Yapsody, Sulekha or EventCombo. At the Event Venue, you will see separate signs and Check-in counters for each of these providers. Please proceed to the check-in counter based on your choice of purchase. Please bring a valid photo ID and your email confirmation (hard copy or a PDF in a Smartphone) to our ticketing team at check-in. If you purchased a group ticket, we recommend your entire party arrives at the check-in desk together. If your group cannot arrive together, please distribute the pages of the pdf such that each person has one unique ticket. If you cannot find your tickets, you can follow the instructions on this page to print your pdf tickets: Yapasody, Sulekha, and Event Combo. How can I get colors? Your ticket price includes one packet of color. In addition to that one, you can buy more color at the event for a nominal price. Please bring CASH !!! Our colors are completely safe and contain no artificial chemicals. They are made from all-natural ingredients and dyes. Due to this reason, we cannot allow outside colors. We are sufficiently stocked on colors. You will be requested to leave the colors behind if found in possession during the bag check. On Saturday- Rasoi Curry Point and on Sunday- Bollywood Zaika will be serving the best flavors of Indian street food, LA has to offer. Please bring CASH !!! Refrain getting in or ordering food from outside. Exceptions are food for babies and people with special diet needs. Is there alcohol/bhaang at the venue? If not, can I bring it? No. Alcohol is neither allowed nor available at the event as per the beach regulations. You may have to pay a fine if Alcohol is found on/ with you. Can we play with water? We do provide clean water for your enjoyment at the event. In recognition of the California drought, we request that we all do our part in minimizing water usage during the event. We request that you observe the posted signage and refrain from swimming in the lagoon reservoir. Are there any facilities for cleaning up after the event? Yes, there are restrooms and outdoor shower facility. We recommend you bring towels and change of clothes. By purchasing this ticket you agree to not hold AID or its volunteers liable for any injuries or illness. You will be exposed to color and water during the event. Please ensure you take adequate measures to wash / dry / clean up and stay safe throughout the celebrations. All visitors will be subject to bag checks. Bags will be checked for Alcohol (Just be You for one day – its cool – we’ll love you anyway !! 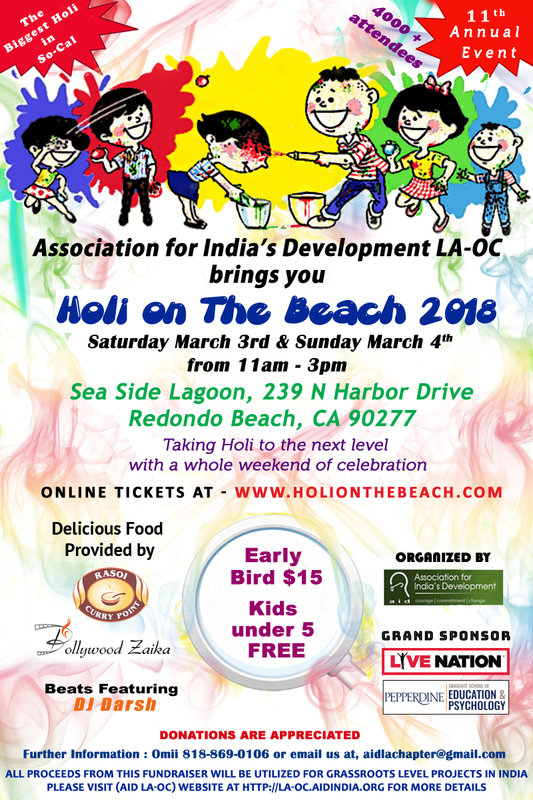 ), Holi colors (Gulaal) and any other potential safety hazards as per the regulations of the Redondo Beach authorities. Any visitor not found in compliance with these regulations will be denied entry to the event. Avoid bringing glass bottles of any kind unless it is for storing baby food. Be wise in your choice and help us run a smooth and safe event. We request you to not bring colors purchased elsewhere, especially gulaal or chemical based colors. The colors we provide at the venue are made from natural sources and wash away easily. Gulaal and chemical based colors are very difficult to clean away at the venue. We are sufficiently stocked on colors. You will be requested to leave the colors in your car if found in bags or on the person during the bag check. What is the Dress Code, and How do we come Prepared for Holi? There is no dress code (No Man-kinis allowed though!). Just wear weather – appropriate and comfortable clothes. Most people come dressed in White to show the colors at their most vibrant! Just be prepared to look different when you leave, from when you arrived! Yes, bring ’em all!! The kids love to get colored just as much as the rest of us, and it’s super fun to throw color all over them and make a big mess! Children 5 and younger can attend for FREE! Parents are responsible for supervising their children. We sell water cannons (pichkaris) and other toys that your little ones will enjoy. Will there be music during the event? LA’s finest DJ will be belting out tunes from the best of Bollywood, Bhangra and also ‘Holi’-themed songs all through the event on both days! I am unable to make it. Can I get a refund or transfer the ticket to someone else? We do not offer a refund or a transfer. We will be unable to move you to an alternate date. Tickets are valid only for the date shown.